After 10 years in the First Division, an absolute record for the Entity under all appellations, the team suffered relegation following a tough campaign from the outset. It was difficult even before the season had begun, as we saw a glimpse of the negative sensations during a pre-season of poor results. Five consecutive defeats at the start confirmed that trend. It wasn’t until matchday 10 that we clinched the first victory of the season, at La Rosaleda, against Celta de Vigo (2-1). Even though the negative results against the team were never that huge, it was the small details that always went against Míchel’s men. Early elimination from the Copa del Rey, losing out to Second Division outfit, Numancia, heightened the sensation that defeat would be a constant travel companion. Not even a psychologically important 0-2 victory against Real Sociedad at Anoeta (matchday 15) sparked a reaction. Four losses on the run before the end of the first round prompted the departure of Míchel, with the team in penultimate position and seven points from salvation. Mario Husillos, who replaced Francesc Arnau heading up the sports management, opted for coach José González for the second round of the competition. However, the change didn’t have the desired effect, and the team wasn’t capable of winning matches despite nearly always enduring a narrow defeat and remaining ‘alive’ in every game. Neither the arrival of numerous reinforcements during the winter transfer window, nor intangibles such as luck or the push from encouraging fans, provoked a change in morale or the standings. The distance from safety widened and the miracle of permanency seemed impossible. As such, the moment that no Malaguista dared imagine arrived. 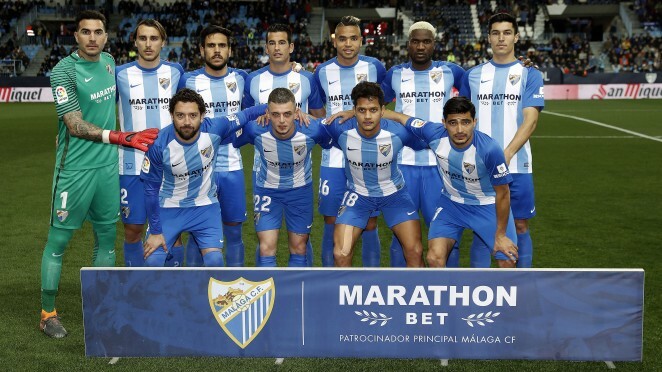 It was 19th April 2018, on matchday 33 of the First Division, when Málaga CF certified its mathematical decline to the Second Division. The 1-0 defeat against Levante UD at the Ciutat de Valencia marked the end of the Club’s most glorious sporting decade. During such a fateful season, the individual aspect brought about some positives. Goalkeeper, Roberto stood out for his massive saves, together with homegrown player, En-Nesyri, who scored four goals – all in the second round of the league – fruit of his energy and fighting ability on the attack. Málaga CF ended LaLiga Santander 2017/18 in last place with 20 points. Uruguayan striker, Diego Rolan, with five goals, was the season’s top scorer. Míchel González and José González (coaches), Juan Carlos Mandiá and Alfonso Cortijo (coach assistants), José Vallejo, Sergio Domínguez, Enrique Ruiz and Manu Gestoso (physical trainers), Paco Ruiz (goalkeeping coach), Sergio Pellicer, Martín Demichelis and Antonio Vilches (technical assitants); Juan Carlos Pérez Frías and Vicente de la Varga (doctors), Marcelino Torrontegui (massease), Fernando Lacomba, Luis Barbado and Iván Medina (physiotherapists), Hugo Camarero (physical adaption trainer)); Josemi (representative) and Miguel Zambrana and Juan Carlos Salcedo (equipment managers). GOALKEEPERS: 1 Roberto, 13 Cenk Gönen and 25/13 Andrés Prieto. 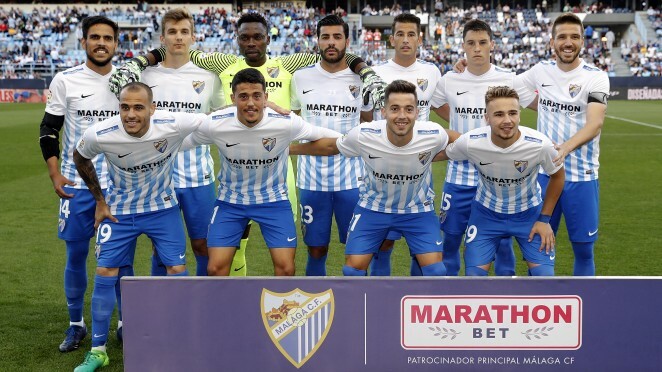 DEFENDERS: 2 Miquel, 3 Diego González, 4 Luis Hernández, 7 Juankar, 12 Cifuentes, 15 Ricca, 18 Rosales, 22 Baysse, 23 Miguel Torres, 27 Álex Robles, 29 Ian Soler, 35 Iván Rodríguez and 37 Alberto López. MIDFIELDERS: 5 Rolón, 6 Kuzmanovic, 7 Iturra, 8 Adrián, 10 Juanpi, 11 Chory Castro, 14 Recio, 17 Ontiveros, 19 Cecchini, 20 Keko, 21 Jony, 21 Samuel, 22 Lestienne, 25 Lacen, 28 Mula and 38 Juan Cruz. FORWARDS: 9 Borja Bastón, 12 Ideye, 16 Peñaranda, 17 Success, 19 Bueno, 24 Rolan and 26 En-Nesyri.